Time to Favor Fake Grass? There was a time when artificial grass was an idea head of it times. The concept of grass that looked green all year round, required minimal maintenance and could be environmentally friendly. What’s not to like? However, the execution previously lagged some way behind the concept. The grass didn’t look real, and it certainly didn’t feel real. But that’s patently not the case now. Developments in fake grass technology and materials mean an artificial lawn now really does feel and look as good as the real thing. Premium suppliers of artificial grass like this company claim now that they can offer an authentic grass experience, and in common with other artificial grass suppliers, offer free samples for anyone yet to be convinced. Offers of free samples from artificial grass suppliers are commonplace, and are an implicit recognition that people may need convincing, and that they are confident that they now have the product to convince them. The improvements in fake grass mean the execution can now realize all of the concept’s undeniable benefits, which are many. For the lazy, time-poor or frugal, artificial grass means never having to mow the lawn again, nor having to pay someone to mow the lawn for you. It also means a garden lawn that look great all year round regardless of the weather. This is particularly attractive for anywhere with a variable climate or an extreme climate as too much heat or too much rain. Previously, only places blessed by a favorable climate could have a verdant lawn all year round. The rest of us may have a short space of enjoying lush, green grass before it reverted to resembling an acrid desert or swampland. Fake grass also means no more wheezing for hay fever sufferers in their own garden; and it also means no more head in hands moments for parents whose children have just destroyed their well-kept lawn by playing on it all day. The materials used in fake turf are durable and built to withstand its platform being used as a playground by kids and animals. 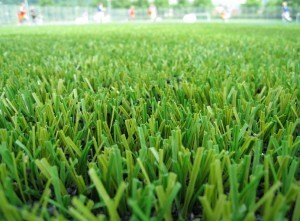 And, artificial grass can be more environmentally friendly too. There’s no constant need to shower it with water which may be in short supply in drought areas. And no need for harmful chemicals, as there’s no weeds for herbicides to attack. There’s no need for pesticides as there’s nothing for pests to munch on with manufactured grass. And there’s no need for fertilizers required to make the lawn grow. Most of the artificial lawns available today are also made from recycled materials. There really hasn’t been a better time to start asking ourselves is all that trouble and work really necessary to enjoy a beautiful lawn or would our effort and cash be better off invested elsewhere. Ecologically one could say that fake grass disturbs the environment. Financially, a lawn is always going to cost you regular fees to keep it looking and living well, but the poor little insects need their home! Heh. This liberates your time, and the savings from lawn care expenses means that this sort of setup pays for itself over time. I’ll have to see if the new types feel enough like real grass before trying out myself though!